If you want opulence and sophistication then this plant is it! 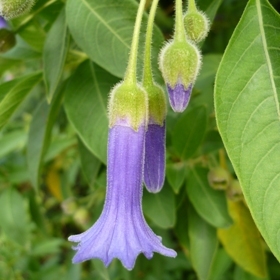 Iochroma cyaneum is a rare relative of the Angel Trumpets (Brugmansia). It has smaller, quite felty leaves and more refined, tubular flowers of variable colours, which, in their native habitat, are pollinated by humming birds. In Britain Iochroma cyaneum is usually a conservatory or greenhouse plant and must be overwintered frost-free. However, our specimen here at BBGG benefits from a sheltered spot next to a warm greenhouse wall. As you can see, it is thriving even after last winter’s cold frosts! Iochromas are relatively easy to root from cuttings. They can be grown in the ground in milder areas and make good potted plant specimens in cooler areas where they must be brought in during freezing weather. The plants take to pruning well and can be kept in a compact shrub shape if desired.